Modcloth is a site for retro and vintage inspired clothes, shoes, and accessories, as well as items made by indie designers. They have a style blog, a section for one-of-a-kind vintage items that have been hand picked by their stylists, and a “Be the Buyer” tab for voting on samples that Modcloth is considering offering in the future. 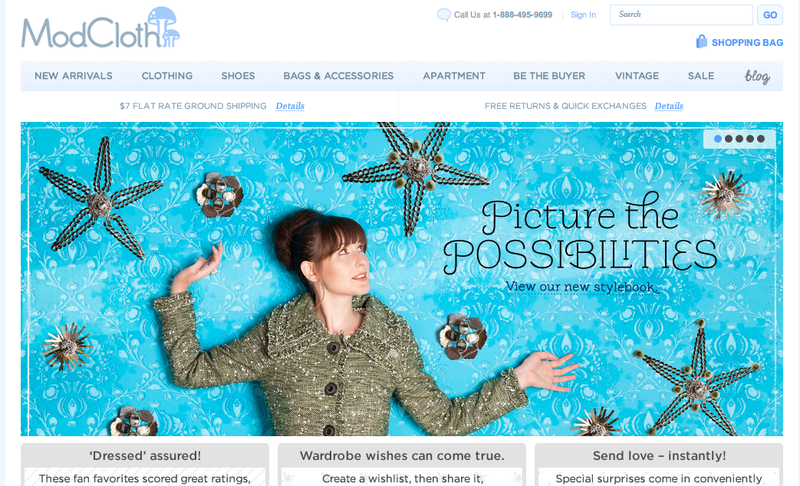 Screen capture of Modcloth.com's clean, trendy homepage. Clean, hipster, kitchy, with a definite retro vibe. The white background and soft blue logo are fresh but funky. They have a lot of products, but clear navigation keeps things simple and easy to use. This is a young company. The founders and most of their employees are under 30. Models appear to be in their 20s, target market could be girls in their teens, 20s, and 30s. This youthful, hip company knows how to leverage social media, and has a wide presence. HTML, the e-commerce site features a shopping cart, and a blog that is run on WordPress.